You may notice in Smitty’s letters that he does not mention his rigorous training or even combat in his later ones. I am unaware as to whether it was concern for his mother’s feelings, censorship restrictions, just plain denial or all of the above. As a child I asked if I would ever catch him in one of the old news reels and he said that he surely doubted it. He made a point to avoid any photographers in the event his mother caught sight of the pictures of him in combat. No matter how hard things had become, he found something else to talk about, but he did have a tongue-in-cheek humor that could both amuse someone even while he was complaining. Work! Work! And more work. After a week here, we still can’t figure when it is all going to end. We put tents up, then take them down. That is our biggest problem — tents. The War Department in Washington has its offices in a large air-conditioned building costing hundreds of thousands of the taxpayer’s money. In this building, they have all the inventing geniuses of the land. All they do is design equipment and little what-nots for us. After that, it is submitted to the boards of Strategy, Health, Welfare, etc. Now, some poor weak underfed inventor designed in a moment of frenzy and excitement, the Pyramidal Tent number M.6606. It passed everything and every board with flying colors — until finally — we got hold of it. We put them up with the loss of tons of perspiration and energy, only to find out later that someone, someplace around here didn’t like the way they looked. That job of putting the tents up was simple and much too easy. They sent down a set of blue prints that reminded me of the Empire State Building with the Holland Tunnel thrown in. Well, next day, bright and early we arose wearily to find that we were to be split up into different sections such as log cutters, tent putter-uppers, log setters and log finders. We, the pole setter-uppers, sat down and pondered over the blue prints. We had to raise the center pole 16 inches, while on the four corners erect eight-foot poles. Then, connecting these poles at the top of 16-foot logs. Sounds very easy, but for some reason or other, the trees grew in the jungle across a stream which all in all made log cutting and finding an exasperating business. Undaunted though, the men went in laden down with axes, saws and prismatic and soon logs were being cut — also fingers, arms and legs. 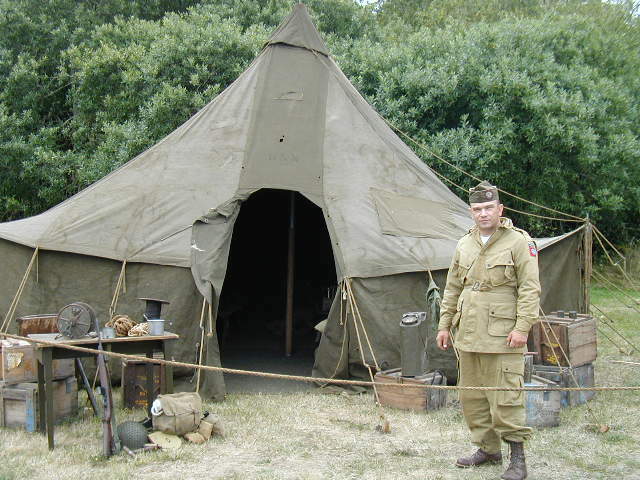 It wasn’t long before we had the amount of lumber necessary to start work on the first domicile, house or tent. We were all set and ready, four men were holding up the corner poles and one man steadied the center pole. The whistle blows for us to fall in and be counted. We fall in, the corners fall out and the blame tent fell down. Oh Well!! What the heck, tomorrow’s another day and after all, the boys that belonged in that tent can sleep out. This routine kept up for days until finally all our tents were erected and set. “Looks good,” we all said and good it was, but not to some of the higher-ups who again decided the tents were now too high and would we please, under threat of court-martial, lower the 4 corner posts to 5 feet. (Oh death, where is thy sting?) Upon completing this last detail, they then decided the tents should all be moved and then lined up on a new line. This has been going on for so long that each morning we have to stop, think and hold ourselves in check, for a few times we caught men automatically tearing down tents or putting up poles where there wasn’t anything to put up. “The heat!” they said, and then gave us half a day off, only to try to squeeze it out of us the next afternoon. Well, maybe they can get blood out of a stone. “Well, that’s all for that in this letter as I don’t want to tire you out completely listening to some of our other minor details that are stuck in here and there, such as digging latrine holes, building officer’s tents and officer knickknacks, polishing up, which we are experts at, K.P. duty, inspections, washing clothes and at night making little things for ourselves such as tables, desks, clothes racks, rings out of coins, wristwatch bands and loads of other do-dads. I guess though the hardest thing is trying all day not to do all this work and go on the gold-bricking standard. That last line would be understood by any buck private or G.I. as absolute fact and truth. 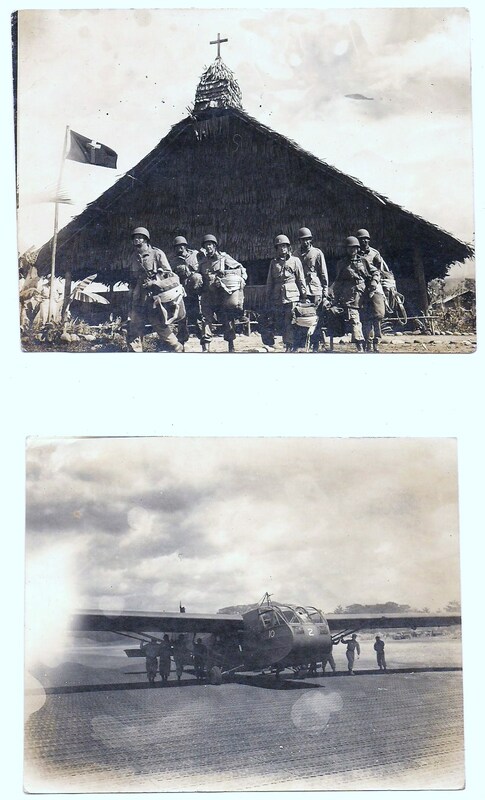 Posted on October 25, 2012, in Letters home, SMITTY, Uncategorized, WWII and tagged 11th airborne division, Everett Smith, History, New Guinea, Pacific War, paratroopers, war letters, WWII. Bookmark the permalink. 6 Comments. Sounds like some of those old tales are true about having to dig a hole and then fill it back in, much like the tent movements. Ask a vet. Thanks for dropping, Bev – always a pleasure. 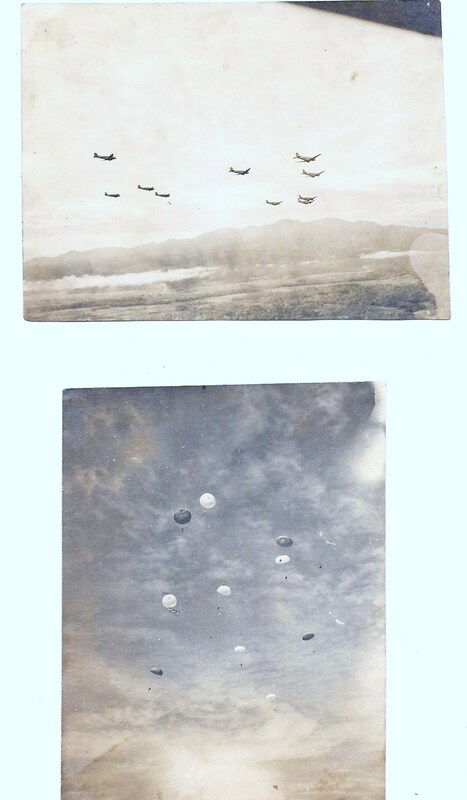 Are these pictures from your dad’s scrapbook? The 4 pix on the bottom are – yes. The tent photo was merely an example.